..::: Bespoke Livery - Fenning Farm Equestrian Centre :::..
Our aim is to provide our liveries with a warm and friendly environment where they feel welcome and relaxed, whilst offering the dependability and flexibility of service they rely on for their horse or pony. We are a small, friendly yard so the personal touch is easy! If you don't see what you're looking for here, give Carol a ring to discuss your own individual requirements. Lessons and competition fees are discounted for our liveries. 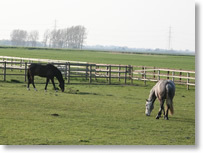 We live on site here at Fenning Farm, so the horses have 24hour supervision.